I summon a map in the courtyard after we return to the castle and ask Karen-nee-san to accurately show the place where she has felt the divinity. 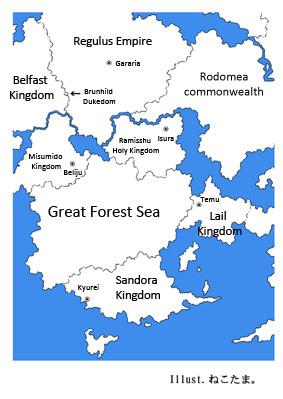 The place she pointed at was to the south-east from here in the Great Forest Sea, after passing through the Ramisshu Holy Kingdom and approaching the Lail Kingdom. Yep, The range is wide indeed. I wonder, will we be able to find whoever is in there?. Which reminds me, Moroha-nee-san was at the Great Forest Sea as well when we found her. I’m guessing there might be some sort of landmark for gods to descend there. Well, my nee-sans can’t use their godly powers unless when they’re dealing with the subordinate god. With regards to Moroha-nee-san though, she’s so exceedingly peerless that I doubt she really isn’t using her powers. Unuu. Does that mean that I have to go greet them no matter what? I’m very reluctant to do that though. I wonder if there’s a way for me not to go… Increasing the number of troublesome people from now on will be… ouch-ouch-ouch! My cheeks are pinched by Karen-nee-san. This person’s perception for those things is unparalleled even by the level of the gods! Though she’s a god herself! The moment I was thinking of that, the other older sister comes from somewhere. It might be natural that Moroha-nee-san would also feel the divinity since Karen-nee-san sensed it as well. Isn’t that dangerous?! I would like for a guy like that to go back immediately! As I listen to the lecture about the gods from those two, I once again affirm that even among the gods there are those with good compatibility and those who without. Well, please excuse me from that. I get seriously tired whenever I keep you company during training, you know. It’s to the extent where I become completely useless for the whole day on that same day. All because Moroha-nee-san comes to me with the serious intent to kill! By the way, the results of our matches whenever I use nothing but swords is 52 defeats out of 52 matches, so what’s wrong with that? I know neither the Katana God nor the Lance God well, but they’re probably similar. Moreover, making them keep her company is… well, if they can become her sparring partners, I would be glad… I suppose? I immediately open [Gate] and we go the border of the Lail Kingdom where I subjugated the behemoth Scorpinas. From there, we then head toward the Great Forest Sea. Moroha-nee-san replies. It will be difficult to go on foot up until Great Forest Sea… Ah, shall I try using “that” which I discovered in the “Warehouse” just the other day? I take out “that object” I’ve placed inside “Storage” and spread it on the ground. It’s something that’s about 4.5 tatami mats in size. I make Karen-nee-san and Moroha-nee-san, who don’t really understand what’s the object I’ve brought out, sit on the carpet. I myself then sit in front of them. At that moment, the floating carpet rises to about 1m in the sky. The carpet starts to slowly advance. By the way, a barrier is applied around the carpet whenever it’s activated, so there’s no way for us to make a mistake and fall down from it or to feel the wind directly. On this occasion, I’ve also applied “Invisible” on us, so we won’t be found by the surrounding people as well. It seems like both of them got used to it, so I raise both the altitude and speed. Though as expected, I can’t do acrobatic moves. Before long, we arrive at the skies of the Great Forest Sea. I stop the carpet at once, and we then come to a stand still. After I lightly unleash “God’s Authority Release”, a similar divinity is released from the forest in the distance. Are they showing us their location with that response after noticing our presence? The ones sitting behind me on the carpet, Karen-nee-san and Moroha-nee-san are showing a bit dumbfounded expressions. I couldn’t grasp that much myself though… Then what the heck is that? Are you saying that there are a lot of gods over there? I have nothing to say for now, but we should be able to understand what’s going on if we try to go there. For now, I make the carpet advance towards the direction where I’ve felt the divinity. I could see someone in an open place inside the forest. No, I could see several people. As we’re descending nearby it, the sound of bustling music becomes audible together with joyful laughter and delicious smell. A party. That’s right, it’s a party. Inside the forest, there’s a youth playing a mandolin-looking instrument, a little red-faced girl drinking alcohol, a woman grilling meat on a bonfire, and a man in his prime eating nuts and berries while smiling. After getting off the carpet, I turn my eyes to Karen-nee-san behind me. Is that it?! Four more gods have descended here, you know?! While I’m being dumbfounded, a little girl who noticed us is waving her hand in large motions. The little girl with a transparent-looking long blue hair, who can only be seen as 7 years old that’s even younger than Suu, is swinging a large turtleneck bottle which doesn’t look like anything but a sake bottle no matter how I look at it. Is that really okay?! Is that kid the Alcohol Goddess?! The one holding the Mandolin-looking instrument should naturally be the Music God. He’s a good-looking youth with a blond hair in his mid-twenties. Although he continues to show a gentle smile, he doesn’t stop his hands from playing the instrument. This person is probably expressing his emotions through his instrument. In fact, he changed the tune of his music after he has noticed us. The man in his prime eating fruits can be seen as always laughing. He has slit eyes with a peaceful appearance, plain brown hair and a simplistic atmosphere around him. This person must be the Agriculture God. In that case, it means the remaining woman with a green ponytail is the Hunting Goddess. There are a hastily-made bow and arrows lying beside her. Although she’s grilling meat, it must be the game she hunted herself. Before that, what part of an animal and from which is that? It looks like meat right from comics. I’m interested! The ponytail hunting Goddess answers Karen-nee-san while mumbling and tearing the pieces of grilled meat. She’s an extremely wild perso… god. What does she mean “aren’t in charge of the Subordinate God”? The slit-eyed old-ma… no, the Agriculture God oji-san turns and points at me. I then point my own finger at myself as well. Moroha-nee-san asks him what she thinks on my behalf. Uoi! Hey! Alcohol God-san, you’re being too frank! Is that what all of this is about? So they’ve used the matter of me having divine powers while still being human as a pretext and descended to the ground, huh? Aren’t you being quite free for gods?! Hearing this, the Hunting Goddess laughs heartily. The Music God casually and nimbly plays his instrument, and it resounds as if agreeing with the other three. Is that person not going to talk at all?! The hunting god-nee-san pushes onto me a wooden cup with alcohol. Well, it’s not like I cannot drink, but she’s quite pushy! The Alcohol Goddess laughs with a grin. Is she drunk already?! I don’t understand her well, and I’m getting worried since she looks like a little girl. Is she okay?! Her head is already bright red. That goddess then walks to me unsteadily and then clings to my leg. What’s she doing…? Why do you know about those?! It’s true that I have some in “Storage”, but still! Is that perception the so-called “power of god”…! The Agriculture God assents to the speech of the Hunting Goddess, and the Music God plays the instrument with a “Po-ro-ro-ro-o-n” sound. Karen-nee-san and Moroha-nee-san sigh as if they’ve given up. I abide by what Nee-sans tells me and take out food and beverages from [Storage] along with a table for all of those foods to be placed. The Hunting Goddess greedily consumes the food while the Agriculture God makes sure to taste them. The Alcohol Goddess drinks while having snacks, so each one of them are eating up the food I’ve placed on the table. Only the Music God continues to play sorrowful notes without releasing his instrument. Eventually, the Alcohol Goddess couldn’t stand it any longer, so she made him hold a yakitori in his mouth. His melody soon became cheerful afterward. As I’ve thought. He’s linked to his instrument and passes his emotions through it, huh? What I want to say is, let go of it already. The nee-sans eventually started to get drunk and seriously started partying. It’s a banquet of gods. Though I would like for this world not to become a pleasure trip destination for gods. I answer with those thoughts to Kami-sama on the phone after separating from the company of the gods who’ve descended and are continuing the banquet even now. I begin to wonder whether it’s really okay for such thoughtless gods to descend, but then I recalled the legends about the gods of Earth that had descended quite thoughtlessly as well. Just now, you’ve just said “troublesome”, didn’t you?! You knew it would become troublesome, right?! What’s this feeling? It’s like having a vision wherein the son, who will be the next CEO, is being treated as a new employee and being told to “Get familiar with work!” by his parent, who is then the current CEO in the company. I grandly sigh after hanging up the phone. What am I going to do now~…? The Alcohol Goddess entwines around me with a grin. This girl is a very bad drunk! To make things worse, I’m being forcefully pulled. What power! Don’t tell me that she’s some sort of kenpou master who becomes stronger the more she’s drunk?! Having been brought up to the table against my will, I have my cup poured with alcohol by Karen-nee-san. Karen-nee-san grins with a red face. You are drunk! You’re completely drunk! You speak like how every drunkard does. Your breathing is becoming strange as well. I then tried seeking the assistance of Moroha-nee-san, but she’s already prostrating on the table. So weak?! The Sword Goddess is weak!! It’s many times better than her brandishing cutlery after getting drunk, but I would’ve liked her to get wasted after she saved me from the others. The Alcohol Goddess drinks with big gulps, while the Hunting Goddess laughs with a dry laugh. The Agriculture God is simply enjoying the dishes, and the Music God continues playing the instrument. Not a single ally can be seen anywhere. Ah, c’mon! I’ve now properly understood the meaning of “Letting sleeping dogs lie”!